Rapper Waka Flocka is turning out to be a pretty stand up guy nowadays. He has turned his wild ways around and has been all about bettering both himself and fans around him. HipHopWired reports: To say Waka Flocka Flame’s music brings the animal out in listeners would be a severe understatement. So the news of a couple of dudes getting in a brawl as the rowdy rapper rapped on isn’t much of a news story. The fact that the Brick Squad general would risk is neck to ensure the peace is, however. 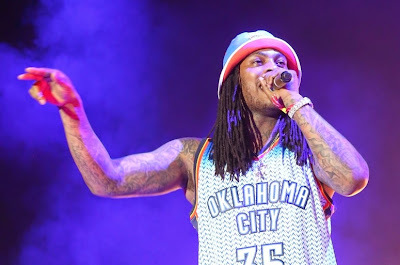 During a leg in for the Turn Up Godz Tour, DJ Whoo Kid captured footage of Waka going hard in the paint to diffuse a situation in front of a shocked and enthusiastic audience. As two men began to square up, Waka yelled at his bodyguard to grab both of them and make them do the unthinkable. “Stop ’em Chello! Them two–make ’em hug!,” he commanded to his bodyguard “Make ‘em hug. Y’all two motherf****rs hug! Hug n***a, hug! Hug him, n***a! Hug him right now. That’s what the f*ck I’m talkin’ about,” he cried after getting the results that he wanted to see. “Now let’s party,” he concluded as Whoo Kid shamelessly dropped a Michael Buffer “Let’s Get Ready to Rumble” soundbite. The Atlanta rapper has repeatedly stated that his time on the road with Steve Aoki opened his eyes to kids who just want to have a good time opposed to being on edge the entire night. Watch Waka Flocka pay peacemaker in the video below. The remaining tour dates can be seen HERE.